Sensory processing affects everything we do. From movement and learning on down to the tiniest snaps and buttons that adorn our clothing. 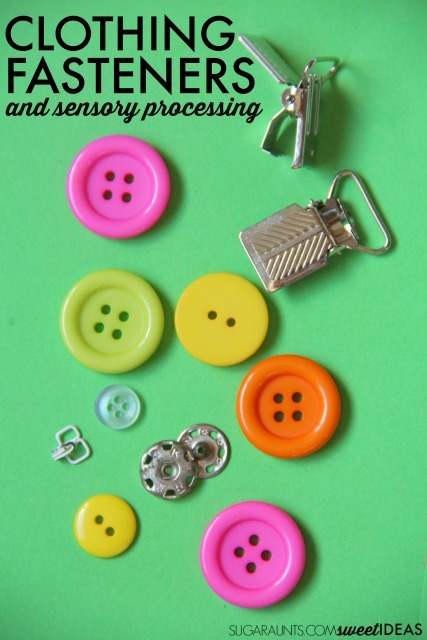 Many times, children with problems with sensory processing skills have difficulty with manipulating clothing fasteners. 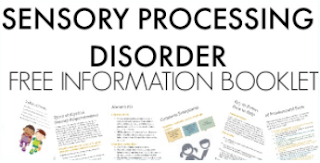 Here, you will find sensory-related issues that may impact a child's ability to fasten and manipulate clothing fasteners, strategies that can help with independence in addressing sensory processing issues, and sensory-friendly clothing fastener solutions. 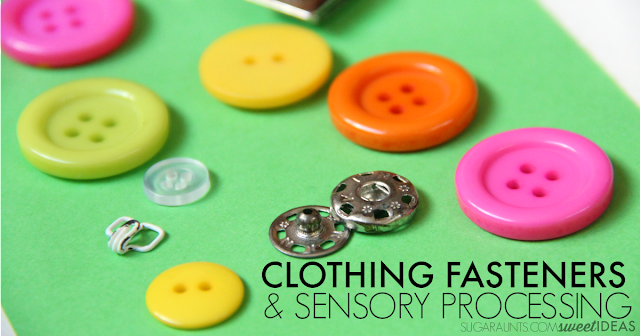 Clothing fasteners and sensory processing issues can affect buttons, snaps, buckles, and zippers. Today in the Functional Skills for Kids series, ten Occupational Therapist and Physical Therapist bloggers are sharing everything there is to know about manipulating buttons, snaps, zippers, and buckles. The child with sensory processing issues may experience patterns of behavior related to many skills needed for managing clothing fasteners. In turn, a difficulty in movement, reactions, balance, and posture can interfere with managing buttons, zippers, snaps, and buckles. Clumsy fine motor skills may present during manipulation of clothing fasteners. Poor bilateral coordination- Children with poor sensory processing often times present with bilateral coordination difficulties. Gross motor tasks and coordinated use of the hands in fine motor tasks at midline appear to be clumsy. Managing buttons, snaps, and zippers are difficult when asking these children to use their hands together. Tasks such as buttoning and zippering require one hand to perform a precision task while the other hand assists. These types of skills challenge the child with poor bilateral coordination. While children with poor bilateral coordination may not have a clear established dominant hand, it can be difficult to manipulate buttons when one hand is not defined as the "skilled" hand. Difficulty with movement- Children with unmet sensory needs can present as fidgety and uncoordinated, making clothing fastener management quite difficult. Poor motor planning (dyspraxia)- A vestibular dysfunction can result in poor motor planning with the child having trouble in planning out the sequence of buttoning and unbuttoning clothing, or engaging a zipper into the chamber, then pulling up the pull. It can be difficult for these children to generalize what they have practice on a dressing board to clothing on the body. Likewise, generalizing skills they have practiced with one sweater (and one size buttons/clothing material/ button hole opening/etc) to another sweater or one zipper to another zipper can be difficult. Seek sensory feedback- Children who present with proprioceptive dysfunction may seek out sensory feedback. Snaps or zippers can be a source of sensory feedback in an inefficient manner. Inefficient body awareness- See below. Inefficient grading of movement- Managing clothing fasteners can be difficult for the child who has trouble grading the amount of movement needed for positioning their arms and maintaining position while fastening clothing. 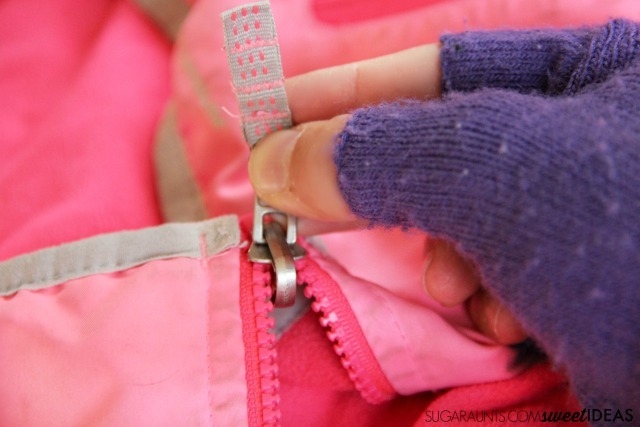 These children might grip the zipper pull too lightly or too tightly making fastening a zipper difficult. Buttons might pull off of clothing when the child with grading issues attempts to button or unbutton clothing. Hypersensitive to touch (Tactile Defensiveness)- The child with tactile defensiveness may have trouble manipulating clothing fasteners. Certain clothing materials can be offensive to children with tactile defensiveness. The texture of a zipper or Velcro can cause an adverse reaction. Stiff collars or zippers, belts, and rough clothing textures and fasteners can cause a negative reaction from the child who is hypersensitive to touch. These children may prefer clothing without fasteners or refuse to wear coats or jackets with these offensive fasteners. Hyposensitivity or an under-responsiveness to touch- The child with hyposensitivity to touch may present during an attempt to complete clothing fasteners. These children may fail to realize that they have omitted buttons or snaps on their clothing. Poor tactile discrimination- Children who have difficulty with discriminating touch have difficulty manipulating items and using their hands without looking at what their hands are doing. These children may be unable to perform the steps of buttoning and unbuttoning, zippering, and snapping clothing fasteners without visual cues. They might perform these tasks in peculiar manners with inefficient grasps. These children may seem to touch their clothing fasteners excessively, such as run their fingers up and down the zipper. They enjoy the sensory feedback from running their hands over clothing fasteners. Poor tactile perception- The child with poor tactile perception will have trouble with perceiving the location of button holes without visually looking at the fasteners. They will have trouble identifying the two sides of a zipper by touch. Poor body awareness- Children with sensory processing issues often times have trouble with body awareness. They have difficulty knowing where their body is in space and how to move it in order to perform tasks. Moving the arms in order to perform fine motor tasks such as buttoning and unbuttoning a sweater can be quite difficult. Poor motor planning (dyspraxia)- Sensory processing issues may present with resulting dyspraxia or motor planning difficulties. These kids have trouble organizing and following through with the movement needed to perform tasks such as buttoning and zippering. These children will have trouble with precision of fine motor manipulation, making engaging a zipper and buttoning and unbuttoning very difficult. Difficulty seeing with eyes working as a "team", particularly when managing fasteners on the body. Difficulty shifting gaze from different planes when managing fasteners on the body. Confuse or mis-align buttons to button holes. May present with increased difficulty when managing buttons on the body. Difficulty with sequential tasks in buttoning or zipper management. Looking at all of these different areas, it is easy to see why the child with sensory processing issues has trouble with managing clothing fasteners! Many children have several of the above issues that present as a result of sensory concerns. Bilateral coordination or low tone concerns may be accompanied by evidence of poor sensory processing. 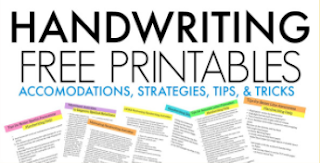 Observations of issues described above may be part of the explanation for difficulty with fine motor manipulation, but it is important to note that every child is different and what is described here may not be the entire story. Strategies and descriptions here will not explain every issue with clothing fasteners when sensory issues are present. 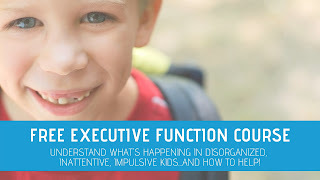 So, what is to be done to help kids with building independence and carrying over skills to allow kids to independently managing buttons, zippers, snaps, and buckles on their clothing? Some children with tactile discrimination difficulties have trouble processing the the spatial or temporal information gathered through touch during tasks such as managing clothing fasteners. Intervention for tactile dysfunction can be done along with intervention for dyspraxia. Deep pressure, activities that provide tactile sensation with temporal and spatial qualities, brushing the skin, using vibrating stimulation to the skin, and tactile play activities can help with discrimination needed for clothing fasteners. Sensory needs may benefit from heavy input through the hands, strengthening, positioning, visual and verbal cues, practicing fastener management on the body, and practicing fasteners while seated or standing. Provide vibrating tactile sensory input with this Orbeez foot spa. 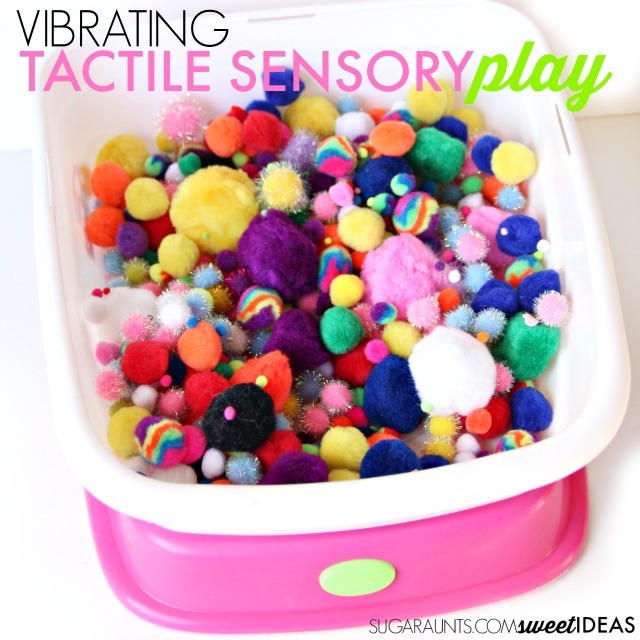 Typically, this toy is used with water beads for a sensory play activity. 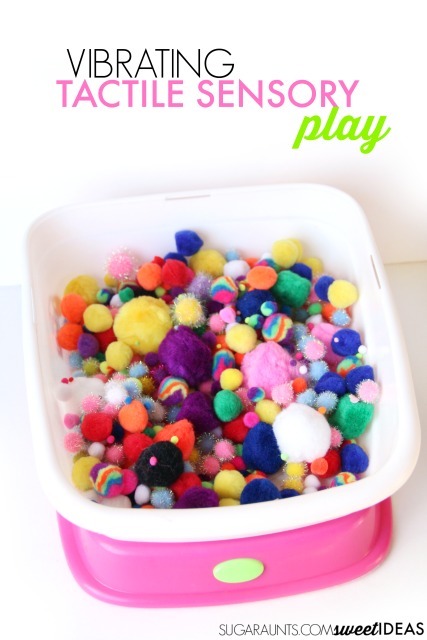 We filled ours with crafting pom poms in various sizes and textures. The vibrating bottom provides a vibratory tactile sensation, which is perfect for the hands. We explored the textures of the crating pom poms as the foot spa vibrated and shook the pom poms. 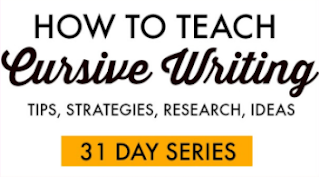 Add additional components to this activity with small hidden toys that allow for visual discrimination, tactile perception, and awareness of body movements. A weighted weighted blanket can be a source of heavy input for proprioception needs. Dress your child in layers that provide deep sensory input. Try a fitted short or long sleeve shirt under clothing. Brushing using the Wilbarger Deep Pressure and Proprioceptive Technique (DPPT). This should be instructed by a trained Occupational Therapist. Outline the button holes with a dark color thread or marker for easy visual perception. Try a zipper pull or a fidget key chain fidget toy attached to the zipper pull. Deep pressure through the hands is a technique that sometimes helps when manipulating clothing fasteners. Try using fingerless gloves in stretch material when practicing clothing fasteners. The fingers are able to manipulate the buttons or zippers and the hand and joints receive deep pressure and warmth.